The Plan’s Audiology Benefit, which is operated by DC 37 Health and Security Plan, is provided in response to the many members who suffer hearing loss problems and don’t have ready access to affordable quality care. This benefit is available only to you, the member, and is provided exclusively at the Audiology Center located at 115 Chambers Street, New York, NY 10007. Please call (212) 791-2126. Eligible members can use the above facility staffed by audiologists who are committed to providing quality audiological service. The Audiology benefit includes a comprehensive audiological evaluation, hearing aid evaluation and dispensing of a hearing aid/hearing aids if necessary. If the comprehensive evaluation confirms a hearing deficiency, the member will be given a report, which should be taken to an Ear, Nose and Throat specialist. The Ear, Nose and Throat specialist will confirm that there is no medical conflict to the use of hearing aids, or will indicate the need for further medical care. The member must apply directly to his/her basic health insurance carrier for reimbursement of the specialist fee. This fee is NOT covered by the Audiology Benefit. Members who have coverage through an HMO must follow the procedures established by their carrier for seeing a specialist. 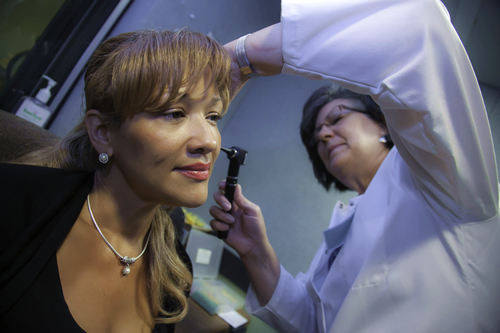 The findings of the Ear, Nose and Throat specialist are reviewed by the Center’s Audiologist, who then determines the proper course of treatment. Effective April 1, 2009, if deemed necessary by the Center’s audiologist, the benefit will provide a maximum of two (2) basic hearing aids (left and right ear) within a three year period at no cost to the member. The two aids must be received at the same time. The audiologist will adjust the hearing aid to insure that it is functioning properly to meet the needs of the member, and will assist the member during the initial adjustment period. Batteries will be provided with a hearing aid, but all future battery replacement will be the responsibility of the member. Hearing Aid repairs (except those under the manufacturer’s warranty) are not covered. The cost of repairs will be the responsibility of the member. The cost associated with rehabilitation therapy needed to acclimate the user to the hearing aid will be the responsibility of the member. The Plan will not service or honor claims for hearing aids obtained outside of the Audiology Center. The Plan will not provide assistive listening devices. If you are experiencing hearing problems, call the Audiology Center at (212) 791-2126 and make an appointment for a screening. If your basic health insurance coverage provides reimbursement for an Audiology Benefit, you will be required to sign an authorization form allowing DC 37 Health and Security Plan to file a claim with your insurance carrier.